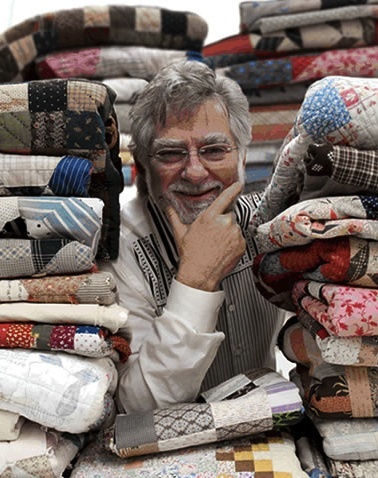 Twice each year Mark’s substantial collection of antique quilts inspires the Howard Marcus fabric lines. A portion of the proceeds from these Collections for a Cause benefit different charitable groups and foundations: the pinks and browns of his newest collection, Faith, will support The Coalition to Support America’s Heroes. The Organization provides aide to severely wounded and disabled veterans who served during Operation Enduring Freedom and Operation Iraqi Freedom, helping them and their families rebuild their lives. In the past, Collections for a Cause have benefited organizations helping to fight juvenile diabetes, ovarian cancer, Alzheimer’s, and more. Mark’s love of fabric developed when he worked with his father in the notions industry. Together they sold zippers, thread, and fabric in Atlanta. When his dad retired Mark moved to Texas, where he opened United Notions and Moda. Thank you for the info, I lived in New York and I use to to into Manhattan and walk by the fabric industry, realizing now what it really meant. Fabric is an art for me. Now I go to Dallas, must drive buy your headquarters one day. What a great post. Thanks for sharing so much insight about Mark. Loved the story. I will be buying a lot more of Moda Fabric in the future. I am not surprised such a leader in the fabric industry is lead by such an inspired man. Bravo for your special way of giving back. Thanks for sharing.